A botanical journey through the world of beer. 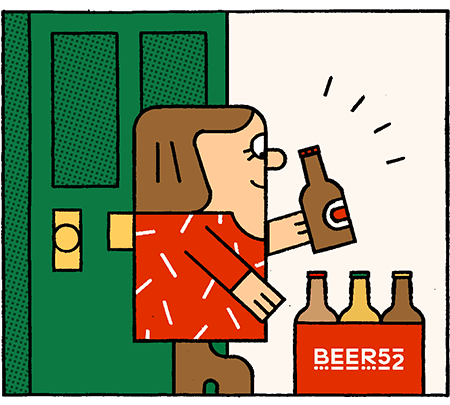 A year ago, I wouldn’t have thought I’d get the opportunity to send my beers out across the UK with Beer52, it’s like a dream come true,” is how Little Wolf’s founder Stefan Wiswedel opens the conversation, beaming with excitement. Back then, he was brewing on a small scale with a cult following among beer geeks, but struggling to make a sustainable business. It was by partnering with Devil’s Peak last year that he was able to turbocharge his journey, ultimately leading to us being able to share his fantastic beers with the Beer52 community. Winding the story back by a few years earlier than that, Stefan originally studied botany at the University of Cape Town. “I began with engineering but somehow gravitated towards botany. I loved the field trips,” he explains. Having grown up in the picturesque seaside town of Haut Bay on the Cape Peninsula, the region’s incredible flora and fauna was all around him throughout his early life. He became a qualified beer judge and earned his General Certificate in Brewing from the IBD (Institute of Brewing and Distilling). All the while, he was discovering beers that he’d never seen back home in South Africa, like barrel aged beers and sours. By the time he returned in 2015 with a palate for quality and consistency, he decided to take the chance to get into brewing properly. He got involved with a 16-person brewery co-op in the trendy Woodstock area of Cape Town. “Everyone could take turns making use of the 100L Brewhouse and then have their own permanent tap to sell their beer through the co-op bar,” he explains. Giving him a unique opportunity to receive direct feedback from drinkers, it helped him to fine-tune his recipes. As for the name, ‘lupulus’, a reference to the botanical name for hops, means ‘Little Wolf’ in Latin. “It just seemed like a great example of botany and beer coming together and made for a great name for a brewery.” he says. The labels were designed with the help of South African artist Adam Hill, who drew upon classic educational botanical posters for inspiration. Because it can sometimes take up to a year to get a license for a new brewery, Stefan decided to get started by brewing a range of tonics and a dry-hopped non-alcoholic cider. We taste the whole line-up and it becomes clear that Stefan has a talent for creating very well-balanced drinks with subtle additions of botanicals. “The hibiscus cider is a real winner, especially with its beautiful colour,” he explains. In the future, Stefan plans to do more to incorporate his botanical knowledge into his brewing. “The Cape Floristic Region is in fact the most diverse plant kingdom in the world and geographically the smallest”. It is a very fire-based ecosystem; “There are species whose seeds only germinate after a fire, for example”. It is also an epicentre for a lot of species that have spread from here to the rest of the world, many of them taken by humans. 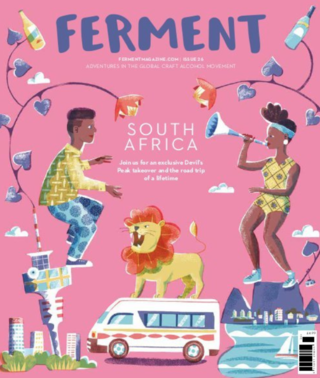 Some of his recent experimentations have involved collaborating with local farmers, meaderies, gin-makers and foragers who are also exploring the culinary possibilities of the ‘Fynbos’. Another experiment has involved using baobab fruit in a saison. “The baobab is one of the only fruit in the world that is naturally dry,” he informs us. He is also working on a collaboration with Stimela, a brewery in Johannesburg. The owner happens to speak Xhosa, one of the official languages of South Africa and one which incorporates ‘clicking’ sounds. His family roots are in an area where amarula fruit grows, so they will be using it in the recipe. With the support of Devil’s Peak, he has not only got the opportunity to explore these exciting new avenues for ingredients. He has also been able to improve the quality of his beers, “I could never get oxygen down to under 500ppm brewing myself, so I was always worried about shelf life.” Now, the quality is so good that it’s possible to ship his beers to as far away as the UK for us to enjoy the first chapter of his botanical adventures in our box this month.